The sell out to the French is no more than a log term, years in the making, completion of a step towards a European Army. One that will be groomed, trained and taught that it's income, salaries and bonuses will be determined by the degree of it's slavish obedience to the new European State. Any attempted mass demonstration against any laws to be introduced or enforced, will be quelled by an army of mercenaries from the disparate corners of The Continent and beyond. Poor Turks will flock to sign up and travel in this newly formed, unaccountable horde. A Foreign Legion bound only by the size of it's pay packet or next campaign to suppress any dissenting voices. The warning cries like mine will be just ghostly echoes over pillaged towns and villages, who dared to suggest it's wrong to drive cultures into a ghetto of sameness and slavery. It is all so reminiscent of history and the seeking of power by despotic individuals or nations. This EU Axis is every bit as shameful and evil as any other marauding ideology since time began. Just think on this. No independent voice will be allowed a decent education or chance. Everything will rest on an oath of allegiance to a ruling elite which will be draconian, cruel and vicious, where any expedience will be made the excuse to justify enslavement. The next partially hidden agenda after the military police are in place, will be enforced taxation. HMRC have already floated the idea of salaries and wages paid to the state and that body determine how much it deigns to offer the earner of that income. Human rights are only those determined by The EU courts. Oppose them and feel the weight and burden of YOUR rights being dictated by the mysterious them. Go on, tell me the names of The EU Commissioners. No one cares or notices unless they are Kiddy Fiddler, egotistical and revered weirdos like Mandy. David Cameron is shown as no more than a deceitful, untruthful, dishonourable man. No more fit to lead this once defender of freedom Country than the mad men foisted on us by the previous NWO wannabees. They sure as hell know the price of things but nothing of their value. Hateful, hateful man and cohorts. I didn't vote Tory in May but now this seals it, I will never vote Tory ever again. Since there is nobody amongst the ruling elite scum persona grouping that truly represents the common ENGLISHMAN I doubt I can see myself voting ever again. 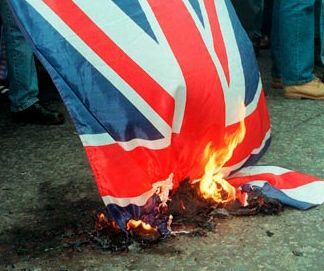 As you say "Farewell Britain"
"Any attempted mass demonstration against any laws to be introduced or enforced, will be quelled by an army of mercenaries from the disparate corners of The Continent and beyond." That's more or less what I've been thinking too. The Chinese government utilised regiments from the outer rural provinces to crush the Tienanmen Square protests. May as well emigrate to North Korea as stay here - they seem to be very good at goose-step marching, mass rallies and executing dissenters. Living in France and having intergrated here I can perhaps make this comment, the French will never allow their military forces to be under the control of anyone else, especially not the U.K. or the EU Commisariate, whilst R.A.F. aircraft have to go through the motions of combat training, the French do it for real, don't believe me? ask yourself this, when was the last time you heard a R.A.F. aeroplane go through the sound barrier at low level? Happens often here, so often it is not noticed, no infantile outraged from Bognor letters to the Times, or should that be La Monde? The French are serious about their defence and any agreement with the U.K. will inevitably suit them financailly, it is not the French who are holding out the begging bowl; The powers that be in Brussels are going to start meeting up with reality soon, as there is NO way France or any other sane govt. is going to let a non elected bunch of self serving egotists allow their armies to be used agaist their citizens. Just as some politicians are realising the big Euro experiment has very grave limitatons, Merkel has with multi-culturalism, Sarko with the Roma/Immigration and the Dutch people voting for a more right wing govt. agaist what is seen as a de-culturisation of their customs and Identity, all who are more prepared to hear their voices, except of course the so called tory coalition, who have yet to cotton on to the fact that all Empires eventually end and the E.U. is going to end a lot sooner than a lot of people who wont see reality realise. Allez OR Courage mon brave. It won't be too bad. And the next French President will probably tear the whole thing up the first time we want their aircraft carrier to do the Americans' dirty work. Poor old Cameron is only doing what the American president told him... It's not his fault he's a useless pratt. But, by the way mr Cameron, if it's "Farewell Britian" can we have our oil fund of €500 billion, just like the Norwegians, before we split up? What's that you say....it's been spent? Goodness, surely not all of it? Oh dear. That's a pity. Still, I suppose you guys had to do what President Bush told you and spend it all in Iraq and Afghanistan ensuring Halliburton's oil. Exits, singing a strange mixture of Flower of Scotland and La Marseillaise. Wha foucht an died fur, yir wee but hill an glen...."
Johnnyrvf thank you for giving me a very warm glow, today! Tris, I fully appreciate your Scottish patriotism and I share your anger at our squandered oil wealth. However, I can assure you that the Sea stretches a longer way down and round the English coastline than Scotland and Wales together! Also the cost of exploration, drilling and refining was too immense for any one of the UK Nations alone. It's never simple, sadly!